This teddy bear paper doll is one of the oldest I still think is well drawn. I drew her back when I was an undergrad. I’d been drawing a lot of dark things, so when I started this my roommate said to me: That’s cute. What are you going to do to it? You don’t draw cute things. Well, I left it as is in order to prove that I darn well could draw cute things. (Truth be told, I had planned on keeping it a simple line drawing.) Though, I must confess, cute has never been one of my personal goals for my paper dolls and I tend to dislike most art which people label as either “cute” or “adorable.” Never the less, I do think it’s important to stretch the sort of paper dolls and doodles I draw and I am always looking for something new- though in some ways teddy bear paper dolls are actually an older trend of mine since I remember draw them as a child. I thought I couldn’t draw people, but drawing bears was much easier. 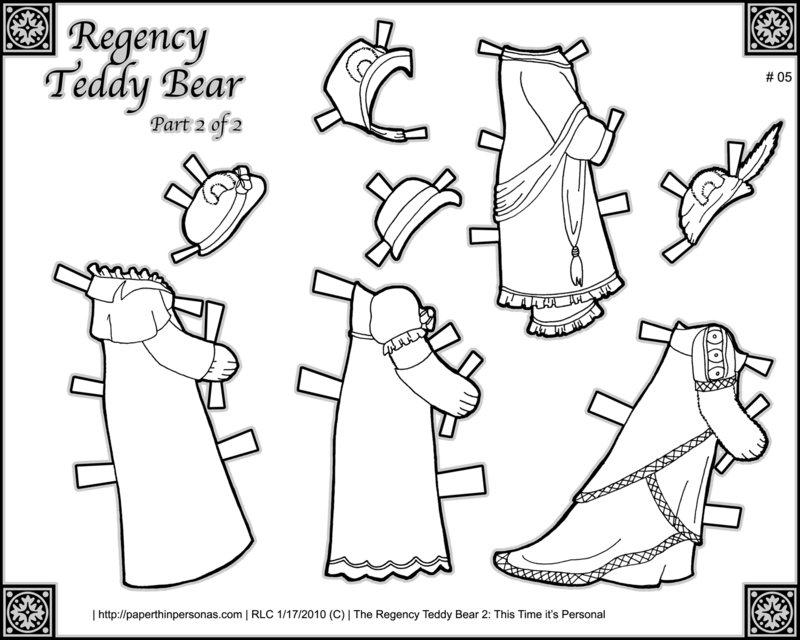 So, if you want to get a teddy bear paper doll to wear some of these stylish dresses, I posted her on January 10th.